Will the Predicted Eighth Year of Drought in Israel be Broken in 2012? Something unusual is happening in Israel; it’s beginning to rain, serious rain. Oh that it is the “Latter Rain” that will literally fall down upon the Land of Israel and precipitate the cascade of the final events associated with the reclamation, redemption and the restoration of the Lost Ten Tribes of the House of Israel. The week earlier, snow blessed the slopes of Mount Hermon and for the first time in 2011-2012, the slopes of Mount Hermon were opened to skiing as three feet of snow covered the lower slopes and five feet covered the upper. During that same week, the entire country of Israel was drenched with rain raising the level of Lake Kinneret by 4.3 inches. By the end of the week of January 19, the Sea of Galilee was 14.6 inches below the “Red Line”, still 2.3 inches lower than the level of the Sea of Galilee stood beginning the summer of 2011. The “Red Line” is the point of caution when no water should be drawn out of the lake. By mid-January, it was still above the “Black Line”, set at 215 meters below sea level, where no more water can be pumped out of the lake. The reason for that level is that salt springs at the bottom of the basin of the Sea of Galilee that are suppressed by the pressure of the heavy water could salinate the only sweet water source in the entire State of Israel. It was on December 11, 2010 that the water level of Lake Kinneret dropped perilously close to reaching the “Black Line” when it dropped to 214.12 meters below sea level. 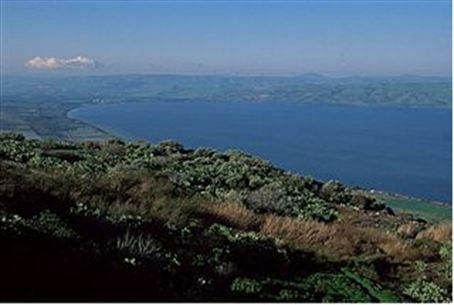 The lowest in modern historical time, the Sea of Galilee dropped was on November 29, 2001 when it reached the level of 214.87 meters below sea level. This lake of spiritual reverence to both Jews and Christians is only 47 meters deep at its deepest point. Its water sources arrive from the melted snow from Mount Hermon in the Galilee and Golan Heights regions. These include: Jordan River, Nahal Meshushim, Nahal Amud, Nahal El-Al and Nahal Yehudiya. Yet when the water level finally reached the “Red Line” on March 2011, the Israeli environmentalists, believing the worst was over breathed a sigh of relief. Then the searing heat of summer, the water level in Lake Kinneret that started the summer at 16.9 inches above the “Red Line” as 213 meters below sea level, ended the summer season at 16.9 inches below the “Red Line”. This was only 56.9 inches away from the “Black Line” where no more water could be pumped out. Even so, as the first month of 2012 was making its debut, the State of Israel still needed 15 feet of water to bring Lake Kinneret to its non-drought status. Maybe it’s time for the Lost Ten Tribes of the House of Israel to beginning praying for a rain filled winter beseeching the G-d of Israel will bring the “Latter Rain” upon His Holy Land. The Jewish brothers to the Lost House of Israel already began to beseech the L-rd when after the Rosh Hashanah, the Ten Days of Awe, and Yom Kippur, they began their celebration at Succot. During Simchat Torah, the 8th day of Succot, the seasonal prayer for “dew” to be sent by the Divine, was changed to “rain” was added to the seasonal prayer for the worship services. It was of interest, as the Christian world was celebrating Christmas and the Jewish world was celebrating Chanukah during many of the same days, four inches of heavy rains in Jerusalem pelted the ancient capital of Israel and severely damaged the Presidential House of Shimon Peres. The damages were so extensive that the president of Israel had to move to move his residence to a hotel before the accommodations could be prepared to move he and his presidential office to the luxurious David’s Village near the Old City of Jerusalem. Two months earlier in October 2011, rain also inundated the presidential compound but at that time did not damage the infrastructure of his residence. With the relocation and repair work needed to be done on the Presidential House, it was not expected that President Peres would be able to return to his residence until April of 2012. By mid-January, the White Winter Snow on Mount Hermon sent the Israeli skiers racing to the slopes as heavy rainstorms drenched the entire country, and blizzards covered the slopes of the Golan Heights closing all major roads over the Shabbat during that weekend. It also blanketed Mount Hermon with 100 percent of the average rainfall for the winter month of January during those few days. Even so, the seven year drought water ban remained in effect even as the snow and rain fell in the Tzfat region of Northern Galilee feeding the thirsty plants and trees in this parched region sharing a relative dry winter. The water ban was expected to continue until the water table of Lake Kinneret reached above the “Red Line”, a line in which the beautiful Sea of Galilee is still 44 cm below drought standards. Even so the Negev and the arid regions to the sought were still 70% below its average rainfall, according to the National Meteorological Service. Yet, while the northern regions were receiving showers in abundance, the parched region in the Northern Negev and in the region south of Be’er Sheva remained rain free. At the same time the water table of the Sea of Galilee continued to climb. It was now only 4.5 feet below the level in which the dams would have to be opened in order to prevent flooding in the lakeside town of Tiberius. Even so, the long term weather forecast for the rest of the week ending on the 28th day of January, suggested that the rapidly changing weather pattern sweeping the nation would continue to call for rain to fall in the northern and central regions of the Land of Israel. 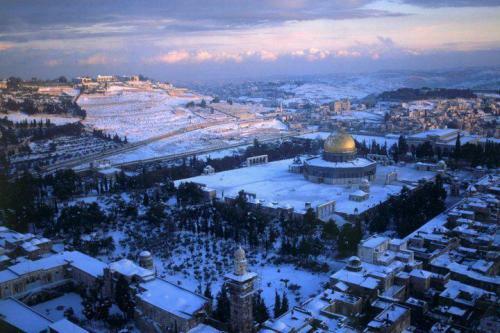 As the Shabbat approached on the 4th of Shevat (January 28) the temperatures were expected to drop and heavy precipitation would settle over the nation. The snow on Mount Hermon would increase and possibly, snow might once again fall upon the hills of Shomron and Judea. The time of the Latter Rain has been recognized by the sages of Judah as coming at the time of the end, or the latter days. It is imperative then to know when the “latter rain” arrives, because this is when we must ask of the L-rd to do and to fulfill certain things. The prophets identifies immediately that the source of information and goodness is from the Lord and not from any other source of authority. So what should be ask of the G-d of Israel? A Lost Sheep of the House of Israel, wanting to come home! On a literal (peshat) meaning, the “Latter Rain” can only identified in contrast with the “Early Rain”. The early rain came at the end of the hot and parched summer, when the fall sowing of grains was dependent upon the proper moisture in the ground. The early rain is the first rain of the Torah year, usually immediately after the festival of Succot in the fall. The Latter Rain came in the spring to prepare the crops for harvest. This was when the sheaves of barley were to ripen just prior to Passover. The most interesting part of this phenomenon in nature will be the facts that the arrival of the “Latter Rain” in the Spring will be associated with also the arrival of the Lost Sheep of the House of Israel. The Lost Tribes are they who have resided for centuries in the Isles of the West, as the Vikings of the North, plus the Dutch, Belgi, the French of Northern France and the Germanic tribes in Germany. Many of these peoples, who have remained the major force of anti-Semitism in Europe, will now do an about face and come forth with their new identity; we are descendants of the Lost Tribes of Israel. At this time, the promises of G-d will come upon them with their new identity. Zechariah 10:6- - “I will give power to the House of Judah and I will save the house of Joseph; I will settle them, for I will have mercy upon them, and they will be as it I had not rejected them; for I am Hashem their G-d, and I will answer them. At the time of the end the G-d of Israel will use all of His Chosen Ones from all Twelve Tribes of Israel to complete His divine destiny for Planet Earth. Most of these “chosen ones” will have no idea of their chosen destiny. Yet, they will become the prime actors in the final act of the “Drama of the Ages”.